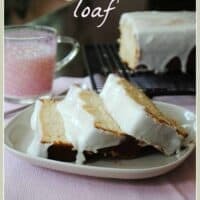 Delicious, moist Lemon Bread with a sweet glaze. Better than Starbucks!! How pretty is this bread? This fall I am leading a Bible study here at my house and I can’t wait to have women come to my home, study the Bible, and fill up on my sweet treats! 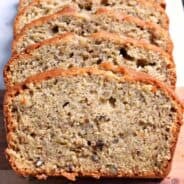 This bread will most likely be going on the rotation, it’s the perfect sweet quick bread that goes well with coffee, milk, tea and laughter! I like cutting my slices extra thick, and I get about 10 slices per loaf. Then I proceed to eat half of them. 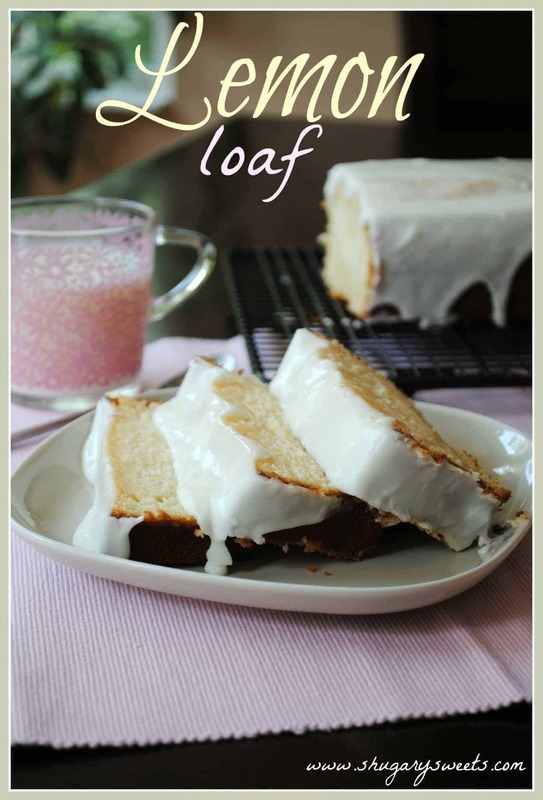 Like this Lemon Loaf recipe? Try these other similar treats…. Zest and juice all five lemons. Set aside. In medium bowl, mix flour, salt and baking soda together. Set aside. In a large mixing bowl, beat butter with sugar until fluffy (about 2 minutes). Add eggs one at a time, beating until fully incorporated. Beat in lemon zest and 1/4 cup lemon juice (about two lemons worth of juice). Beat in flour mixture and sour cream alternatively until fully combined. Pour into a 9"x5" loaf pan that has been coated with baking spray (I line the bottom of mine with parchment paper as well, as an extra precaution). Bake in a 350 degree oven for 65-70 minutes. Cover with foil during the last twenty minutes to keep the top from browning too much. Remove from oven and let sit in pan to cool about 15 minutes. Remove to wire rack. To make simple syrup, whisk together 1/4 cup sugar and 1/4 cup lemon juice (juice of about 2 lemons). Heat in a saucepan on low until sugar is completely dissolved. Remove from heat. Poke holes using a toothpick into the top of your warm loaf. Spoon simple syrup over the top of the bread slowly until all dissolved (this makes the bread so moist)! Allow to cool completely. 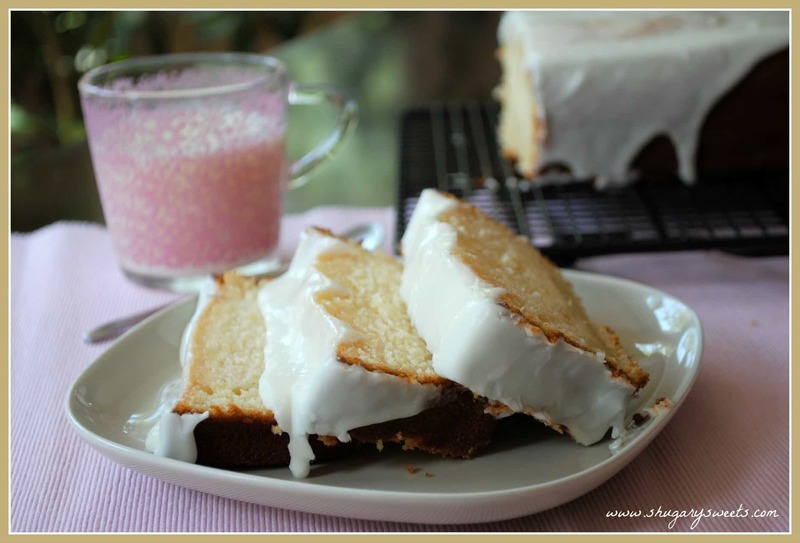 For the glaze, whisk together the powdered sugar, heavy cream and remaining lemon juice. Add more cream if necessary to get desired consistency. Pour over cooled loaf. Allow to set (about 15 minutes). Slice and enjoy. This bread is delicious after refrigerating as well! I’ll gladly take a slice or two of that off your hands! You eat half…I’ll take the other half!! This looks so good! And I spy a cute IKEA cup and placemat:-) I love that you are leading a Bible study this fall…I wish I lived close enough to attend. What book/series are you studying? I think our first one will be one of the Women of Faith series. I have to go pick it out still! Wish you could come too! Aimee we did the women of faith one on contentment and really liked it! What a beautiful cake to serve over a special time with friends while bonding over GOD! Thanks Ellen, couldn’t agree more! This sounds so good Aimee! Me and lemon are becoming besties. This looks fantastic. I am sure it will be hit. Yum! This has to be my favorite cake ever! I love all things lemon, I really do! But a lemon loaf makes me especially happy! I love glaze on quick bread. Thanks for stopping by Sally! This is a beautiful loaf of bread! 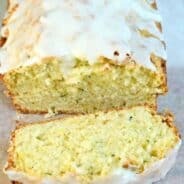 I love lemon bread! Thanks for the shout-out! This bread looks mouthwatering! YUM! Mmmm…Aimee, it’s gorgeous! It’d never make it past my kitchen. I’m a glutton for lemon treats! I’m one of those eat-half-the-baked-goods-all-at-once types too. 🙁 And lemon bread?! Love it. The glaze just puts this over the top! How did I miss this?!!! Love lemon! Pinning now! I saw a couple of recipes you had featured in your blog for Valentine’s Day. I am wondering if you happen to have or tried Maraschino Cherry Bread. I have looked at some places and they don’t seem to taste like the one I tried recently at a restaurant I don’t want to name in here. Your lemon loaf definitely looks so good! Oooh, I have never heard of maraschino cherry bread!! It sounds wonderful, I’d love to have a better description and I’d be happy to try to recreate it!! Going to try as is and make a second loaf with limes instead of lemons. can’t wait. 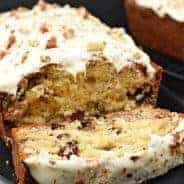 Love all things lemon, am also making this for the ladies after Wednesday night bille study .I, amsure it will be a hit with everyone .Thanks for sharing it . This was really, really good. I have made it several times now and it always turns out. It is my go-to recipe when I have to bring a dessert. This is off the charts delicious!! It’s not crazy lemony, but a subtle flavor that is delightful. I use farmers market lemons and highly recommend it. Thanks for sharing. The video says two loaves, your written recipe says one pan?